Coltishall and Horstead: If we’re much busier now – how was it centuries ago? We were a thriving communications hub in the late 18th century, reports historian Margaret Bird, editor of the Diary of Mary Hardy. All around us are signs of the role in transport communications played by Coltishall and Horstead roughly two centuries and more ago. The villages played a pivotal role in the local infrastructure on land and water. They punched above their weight. They were fairly small in population terms: 601 at Coltishall in 1801, 370 at Horstead with Stanninghall. Great Hautbois, the downstream area of which is often seen as forming part of Coltishall, numbered only 68. There were few public houses: only the King’s Head and White Lion at Coltishall, the Recruiting Sergeant at Horstead, and the White Horse at Great Hautbois (now Bridge House). Apart from the tiny White Lion, tucked away on the approach to Coltishall’s mediaeval heartland of St James’s, the pubs stood on major strategic points along road and river highways. Coltishall, rather more than Horstead, had long been a thriving inland port. Until 1779, when the navigation opened fully to Aylsham, it was also the head of navigation supplying a huge swathe of the hinterland. Its importance to the local economy had been strengthened from about 1550 by the arrival of Tyneside coal, transhipped at Great Yarmouth. From that moment the village turned its face to the water and inland areas became sidelined. The prosperous merchant houses familiar to us today, many with shaped gables, all date from after the coming of coal. Most look to the river. The Old House, a brewer’s house, is one of the few locked inland. The manor house moved from mediaeval Hackford Hall, close to today’s Old Hall. Postills (Postle’s) became the manor, right against the river, with its own maltings, granary, cinder ovens, great barn and wherry dyke. Coal supplied the breweries springing up from the late seventeenth century. Malthouses relied on coked coal, known then as cinders, either brought up from downstream or coked on the spot. Coal would taint the malt and give a foul taste to beer, so the malt-kilns were fuelled by coke. By 1780 Coltishall had eleven malthouses, mostly beside or close to the river. Coal, coke, malt and beer built up Coltishall’s economic muscle and made it a distribution hub. The river became the highway for trade. As with all inland ports the village developed a series of staithes, public and private, along its banks. On these stood lockable warehouses, as seen in Stone’s view of Coltishall Bridge. Mary Hardy in her diary, written at Coltishall 1773–81, shows us that the King’s Head Staithe (where the Rising Sun now stands) was the focal point of the village. Much of this changed suddenly in 1779. Aylsham, Buxton and Lamas now challenged Coltishall’s status. A malthouse was built on the Horstead bank beside the navigation just upstream of Coltishall Bridge as early as 1776, the year after the lock was opened; the long building still stands there today. Now sturdy carts streamed from the quays of Aylsham’s canal basin to the coal-starved inner regions of the county like Reepham and Cawston. Aylsham usurped much of Coltishall’s trade and its role as a distribution centre. In the short period 1786–1800 the three wholesale breweries of Coltishall, with their strings of tied houses across a 20-mile radius, merged into one to try to withstand the pressures of the time. The number of malthouses dropped, as we learn from the church ratebook. Tellingly, the excise service started to pull out the number of its officers previously kept busy in the area. Coltishall had been promoted to an excise district in 1758, reflecting its glory days as a generator of national wealth. It still held that position in 1789, but was soon afterwards demoted to a division. In 1808 just two riding officers were based there. Cornmilling too suffered. Buxton and Aylsham watermills greatly expanded production in the years after the opening of the navigation; Horstead Mill struggled to compete. It is sign of loss of impetus when a population stays still or declines. In the ten years to 1811 Coltishall’s rose by only two to 603. Horstead’s actually fell by three, to 367. There was a special reason for this. In 1806 a large incorporated workhouse opened at Horsham St Faith, and the poor and infirm of the neighbouring parishes were shipped off there. They were no longer the parish’s responsibility. In the forty years 1780–1820 a long succession of bankruptcies and financial failures marked a fall in trade in the Coltishall area. Meanwhile what was happening on the roads? Horstead, as today, stood at the junction of the Norwich-to-North Walsham road and the Aylsham-to-Great Yarmouth road. The arched bridge at Coltishall, which survived until the 1912 floods, carried this busy trade. Two public houses principally benefiting from this traffic, the Recruiting Sergeant and the White Horse, got a boost in 1797 with the turnpiking of the road to North Walsham. The 15-mile journey now became much faster. Horstead and Coltishall lay at the halfway point, an ideal location for travellers to get out, have something to eat and drink and rest their horses. But the Norwich–Aylsham road had been turnpiked in 1794, again contributing to Aylsham’s pre-eminence at the expense of Coltishall. The earliest view of Coltishall? The view by James Stark of Lower Common, then known as Newgate Common, may be the earliest representation of the appearance of the village. But it is a highly misleading one. 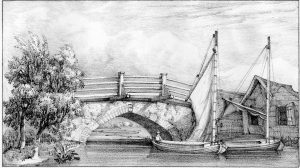 The artist is looking downstream from the King’s Head Staithe towards the little pleasure-boating island still there today. He shows us a pastoral idyll. However he was standing among granaries, maltings, coal yards and timber yards. These have been airbrushed from our view. He has considerably narrowed the river to bring the cattle into the desired position; the common too is on a pronounced slope, to create the right effect. The legacy of the Norwich School of Artists, of which Stark was a leading member, has been to depict the Broads as the haunt of vessels drifting gently along in light airs. In fact we know from the passage times recorded by a clock-conscious Mary Hardy for the family’s wherry William and Mary, built at Wright’s Yard just upstream of the King’s Head in 1776, that keels and wherries sailed fast and made the most of every bit of wind and tide. Vessels used by the Hardys sailed even on moonless midwinter nights. Obviously no painting of night-time sailing was made by the Norwich artists; nor on the whole do they depict the foaming bow wave and wake produced by these powerful traders. Instead the painters have cast a restful, dreamy overlay across the high-pressure lives of the people of the Broads two centuries ago. Manufacturing has now largely ceased; distribution has adopted new forms. But when visitors enjoy a local pint, or when holidaymakers bring a boat up from Wroxham and Horning, they are taking part in a long tradition of the servicing of passing trade. It is one very much to be celebrated in these welcoming villages.